Today's ink is Sailor Jentle Yuki-akari, "Snow Light Blue" from the 2016 Four Seasons collection. Recently Sailor switched from 50ml bottles to 20ml bottles, but some retailers (like Pen Chalet) still have 50ml bottles left. Yuki-akari is a light, bright blue. "Snow Light Blue" is a great name for it. In large swabs there is a little bit of shading. On Staples 24 lb copy paper there was a little bit of feathering, and a tiny bit of bleeding, mostly in the flex nib. 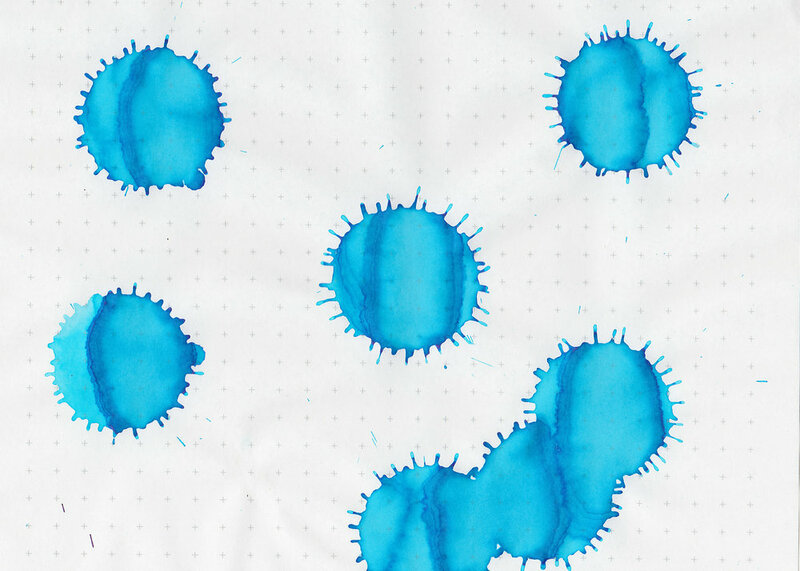 Ink swabs for comparison, left to right (top to bottom for mobile RSS): Diamine Aqua Blue, Sailor Jentle Yuki-akari, and Montblanc Miles Davis. Click here to see the Sailor inks together. Aqua Blue is darker, but the closest in color. Lamy Pacific Blue, Montblanc Unicef, and Robert Oster Australian Sky Blue. Click here to see the blue inks together. I used a medium Pelikan M805 Stresemann on Midori MD paper. The ink had an average flow, not as wet as some of the other Sailor inks I've tried. If you look at the bottom of the pen, you will notice the piston is screwed out, because toward the bottom of the page I wasn't getting much ink until I primed the piston and realized I had written the pen dry. Overall, I like the color, and it's pretty well behaved. It is a bit light in smaller nib sizes, but since I prefer broad nibs, it's dark enough for me to use everyday. Disclaimer: Pen Chalet provided a sample for the purpose of this review. All photos and opinions are my own. This page does contain affiliate links.